On today's agenda: a pocket!!! Wait. It's not as pathetic as it sounds. 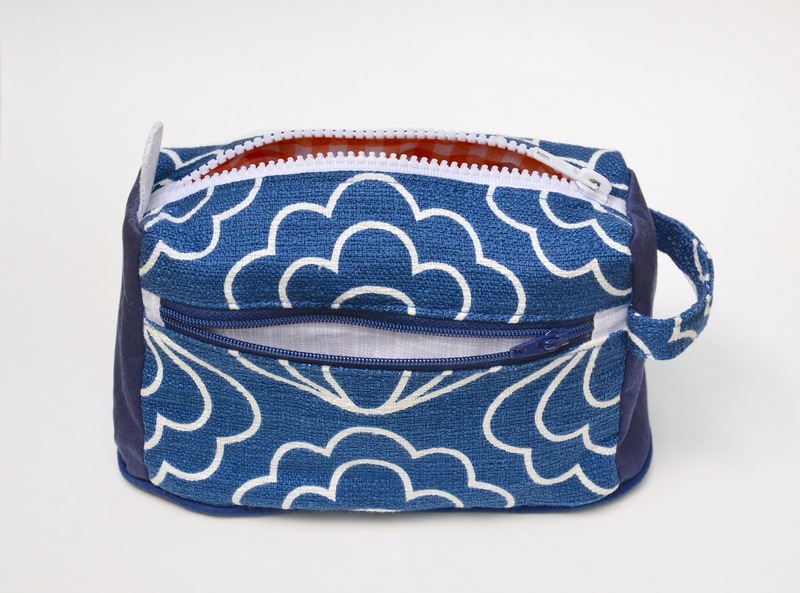 We're going to do one last post on the central-zipper design and make this boxed pouch today. The fabric is Jessica Jones' Time Warp barkcloth (Ripple Navy) by Cloud9 fabrics. 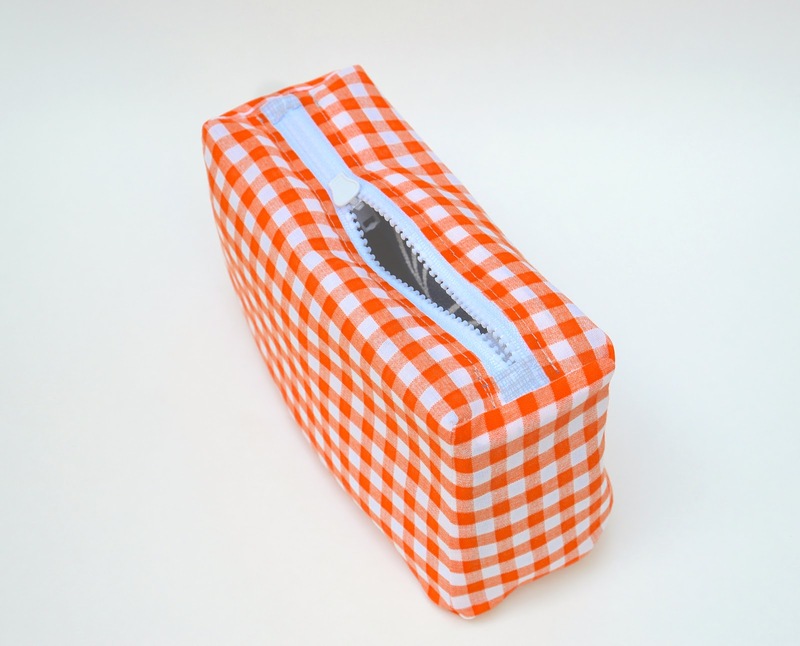 This pouch was loosely based on an ancient toiletries pouch I found in IKEA decades ago. I say "loosely based" because that IKEA pouch, being a mass-produced commercial thing, wasn't lined and instead had bound seam allowances on its WS. We home seamstresses, however, don't have to settle for bound seam allowances. 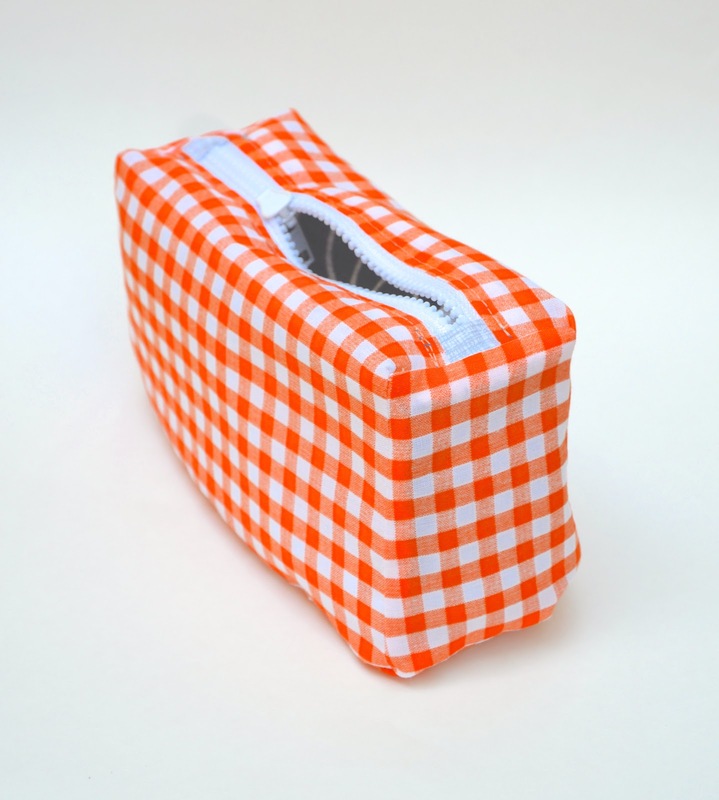 We home seamstresses line our pouches. Now, this pouch is almost the same as the darted pouch in our last post (except we construct it blocked-style instead of darted-style). Also, it has a side pocket. Which is also faced and lined. I am excited about sharing that with you today! Let's first look at all the main pieces we need. All the dark blue things form the outer layer. 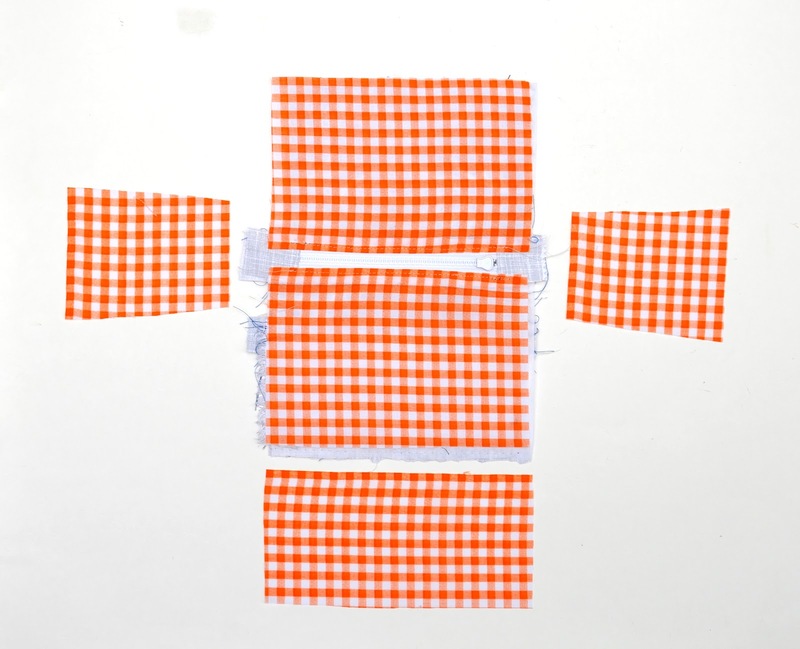 All the orange gingham things form the lining layer. All the pale grey crosshatch things form the pocket innards. In addition to the main pieces, we'll be using two zippers, one strap/handle and one tab. The zippers are both prepped for installation with fabric stops. We'll construct the pocket first. 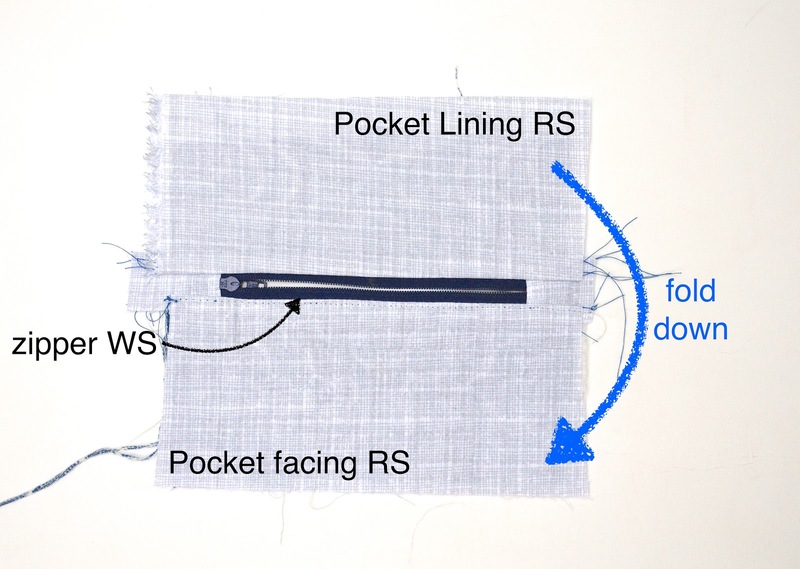 A typical pocket consists of three layers - the outer layer (visible on the RS of the finished project), the facing layer (which faces the pocket's zipper), and the lining layer, which backs the pocket. Here's a quick exercise: find those three pieces in the photo below. Note that those three pieces are about the same size. I say "about" because I often cut my pieces a little bigger, depending on their frayability, to be sure that none of them inadvertently shrink during the making process. At the last stage before enclosing them within the project's main seams, I will trim them all to size. 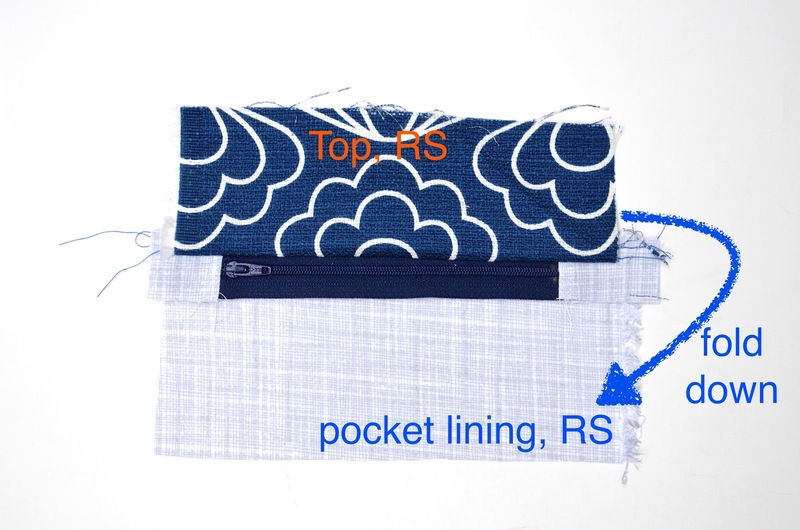 The 4 pieces above will form one SIDE panel of the finished pouch. This panel is split into two portions: the upper portion, which we'll call the side (top) and the lower portion, which forms the pocket. Between then, we'll install the zipper. Note also that I have paired the pocket lining with the side (top) instead of letting it hang out with its BFFs (the pocket and the pocket facing). This is to reflect the assembly configuration. We'll face the top edge of the zipper first. Sandwich the zipper between the RS of the side (top) and the pocket lining. 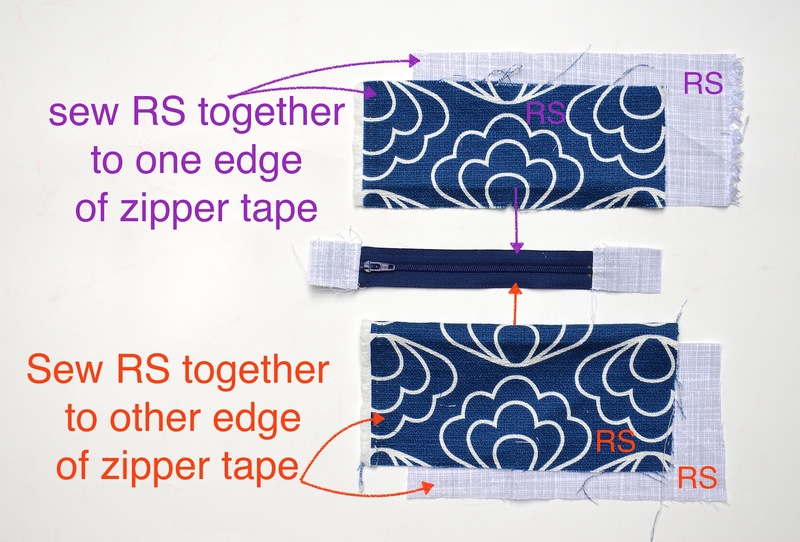 Sew to attach one side of the zipper tape to those fabric pieces. 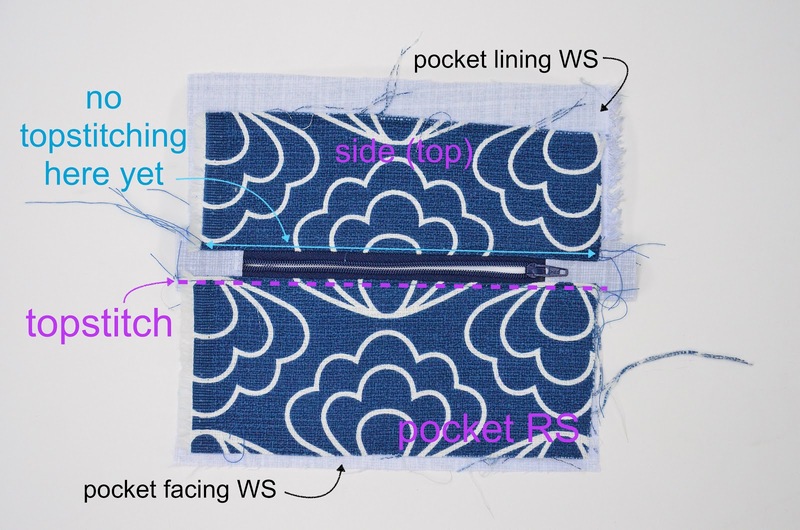 Note: remember that this is not the main zipper of the pouch, which connects its outer layer to its lining layer. 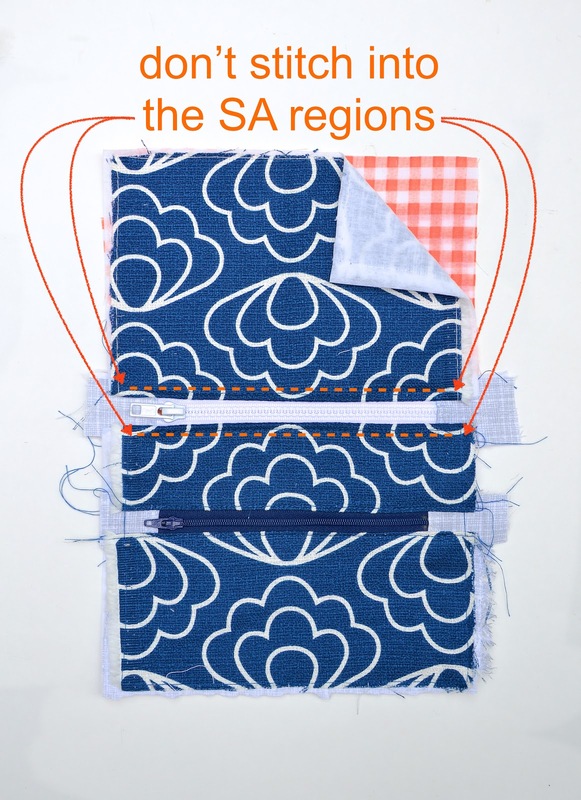 If this were the main zipper, we'd have to do the "Don't stitch into the SA region!" thing (see this post for explanation). This zipper belongs to the pocket. 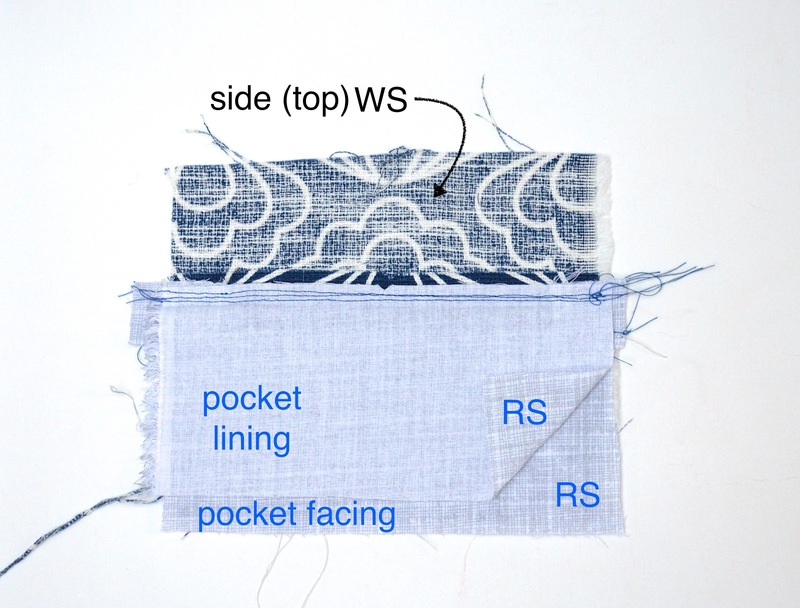 The pocket is a stand-alone embellishment that isn't connected to the main lining layer. Therefore, its side SAs belong entirely to the pocket. So go ahead and stitch all the way to the edge of the fabric. A pause while I digress. Let's flip that side (top) piece up. 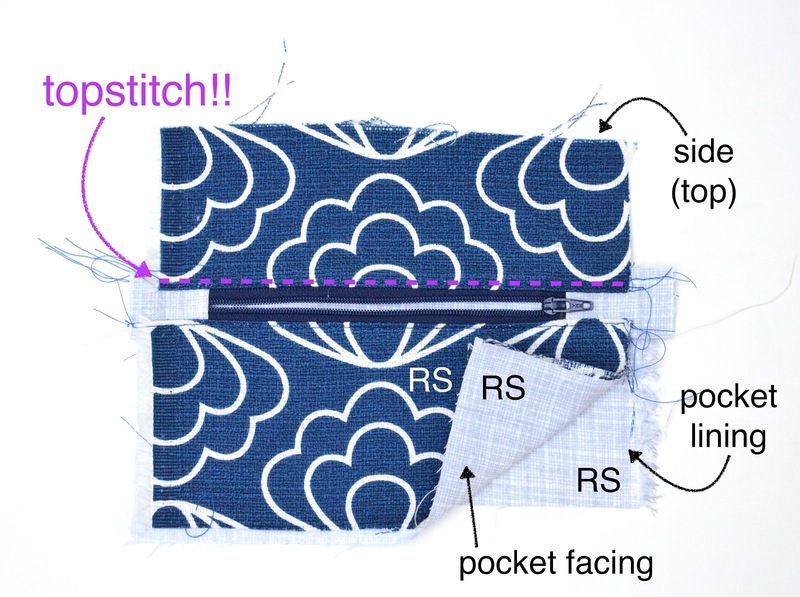 This will be the configuration in the finished pouch. 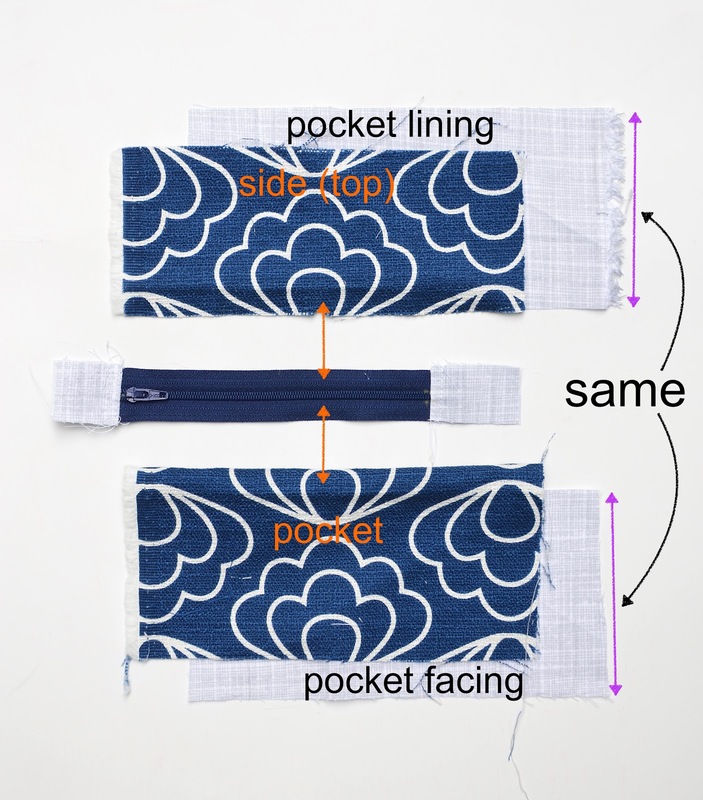 The pocket lining will remain below the zipper, forming the back wall of the pocket. I'm showing you this so you won't be tempted to topstitch (yet) along that seam you sewed in the earlier photo. Now flip that pocket lining up behind the side (top) piece, leaving the lower edge of the zipper tape exposed. Face that lower edge of the zipper tape now, with the pocket and the pocket facing pieces. Then fold them back to reveal the zipper. You can go ahead and topstitch along this lower fold (purple dashed line). Here is the back side. If you enlarge the photo, you'll see that line of topstitching below the zipper. leaving the side (top) piece all by itself above the zipper. Now the pocket's 3 layers are together again below the zipper: the pocket lining forming the back wall of the pocket, the pocket facing forming the front wall of the pocket, and the outer fabric pocket piece looking all pretty on the outside. 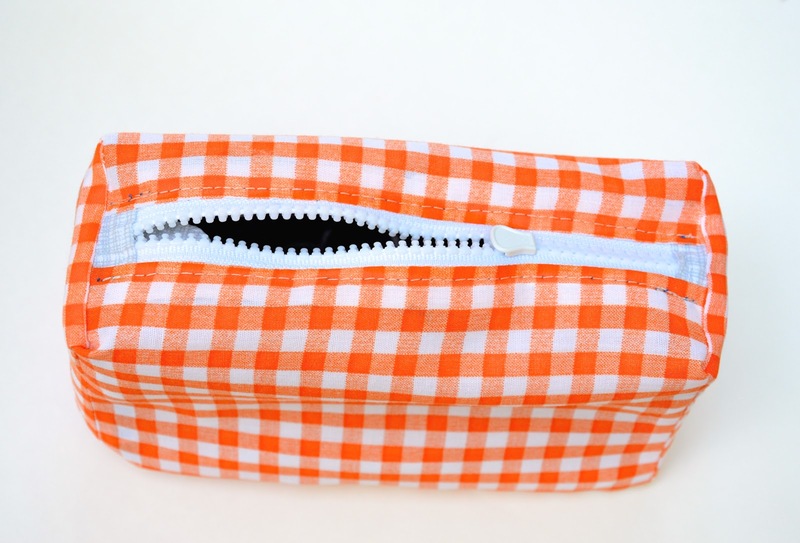 You can now at last topstitch along the upper fold of the zipper seam. 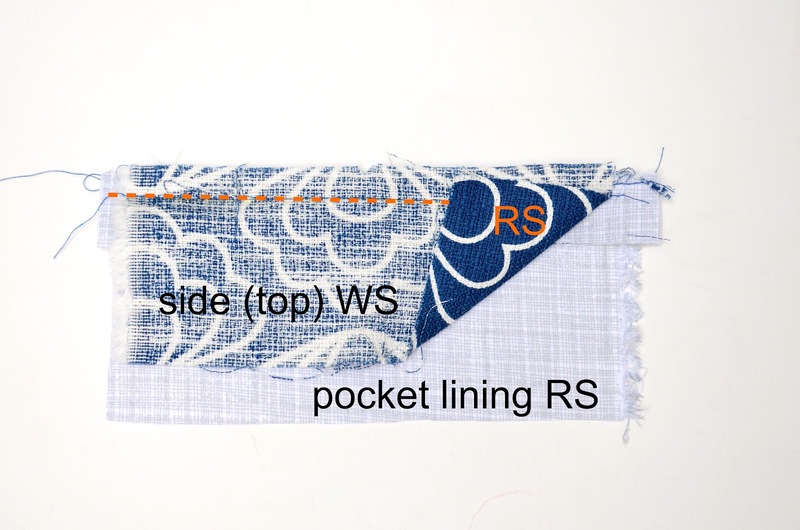 And, if you prefer, also sew the sides and bottom edge of the pocket, and trim off the excess SA. The pocket is now finished and, together with the other pieces, this side panel can now be assembled into the pouch. 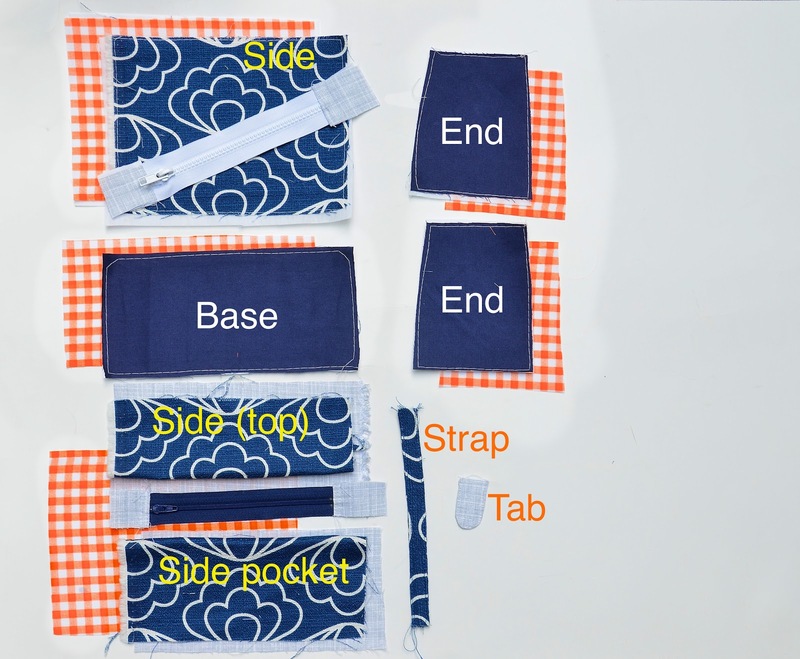 This next step is the same old boring thing we've been doing in the past 3 posts - attaching four pieces of fabric (2 outer, 2 lining) to a central zipper to form the body of the pouch. You'll recognize the pocket panel from Stage 1, of course. From now on, it's simply behaving like one half of the pouch body. This zipper being the main zipper connecting the lining to the outer layer, we must now ensure all our stitching lines stay out of the side edges' SA. Let's speed through the rest of the construction now. 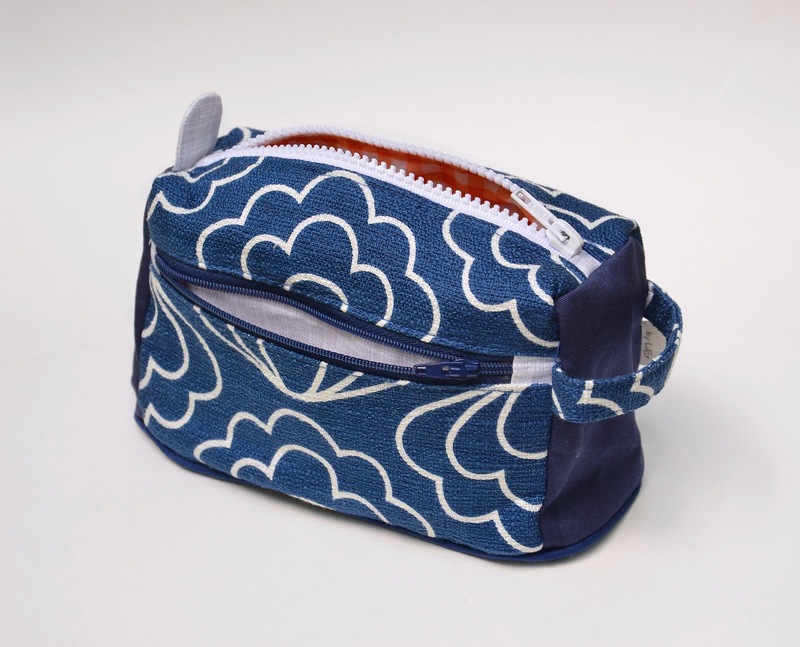 This pouch is put together, blocked-style. Match up the letters in the photo below to visualize what goes where. The dashed lines EF and GH are fold lines. AB to AB and CD to CD to attach the base to the main pouch body, to get a cylinder. Attach the two end pieces to the open ends of the cylinder. If you intend to insert a strap/handle/tab, insert that into the relevant end seams here. 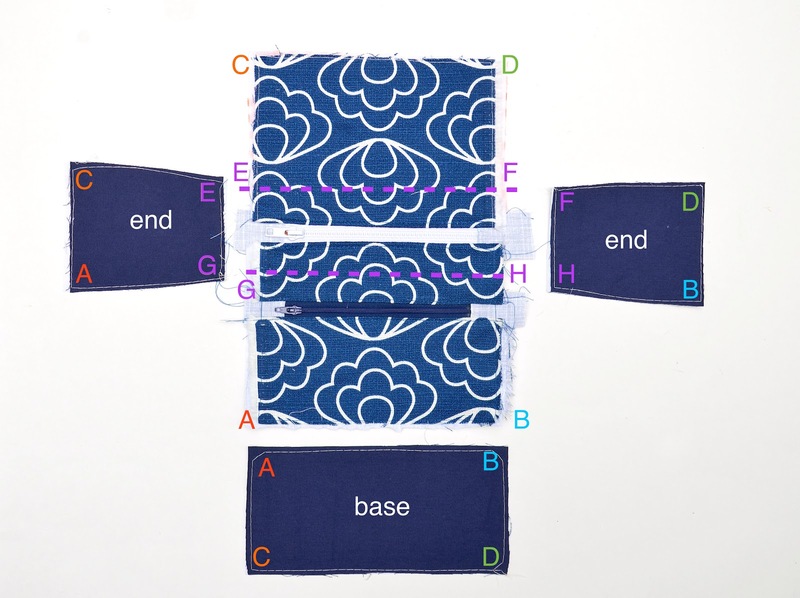 Update to add: in response to a commenter's question: here is an older tutorial showing how to get those neat corners at A, B, C, D, E, F, G and H.
This is the lining configuration. 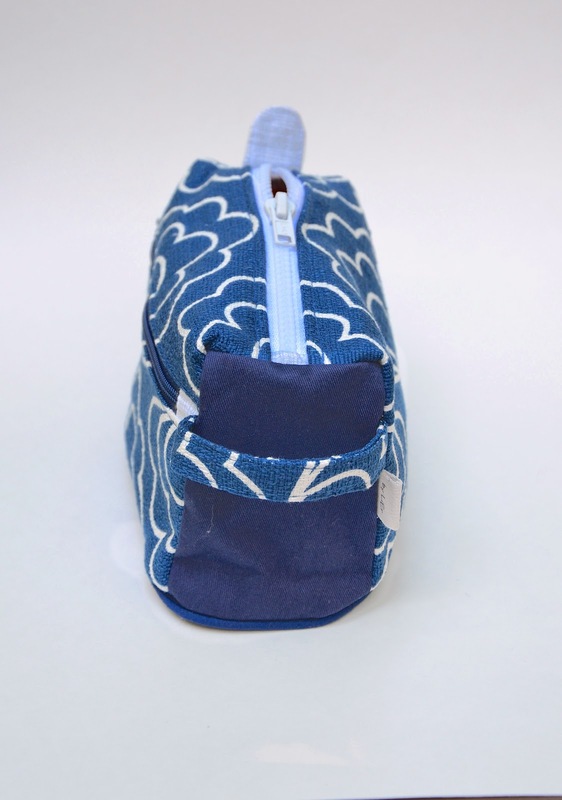 The main pouch body has the lining pieces attached at the zipper, but the base and ends are loose and will need to be attached. Follow the same sequence as for the photo above. Leave a gap in one of these lining seams for turning everything out, then hand-stitch this gap shut. 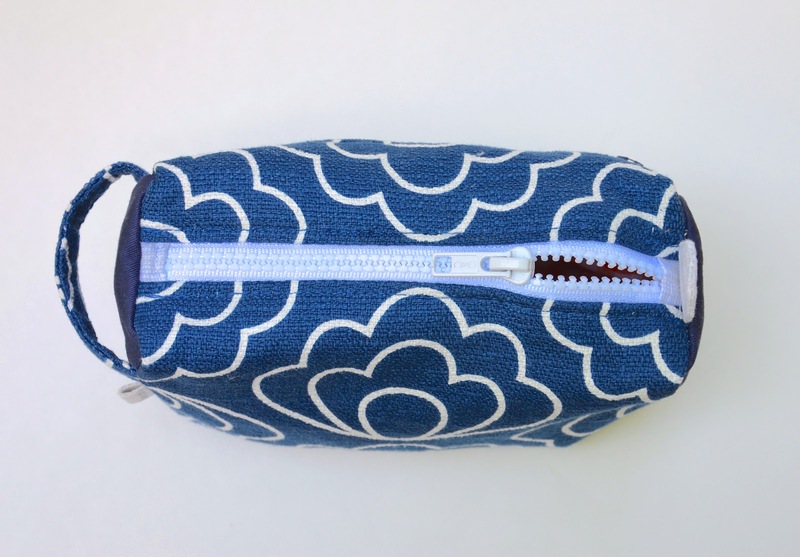 Photos of the finished pouch - outer fabric side out. You can visualize those fold lines EF and GH where the main body piece turns around the top corners of the edge pieces. Are the wheels turning in your head to adapt this design into a favorite bag by adding longer end straps or shorter side handles? 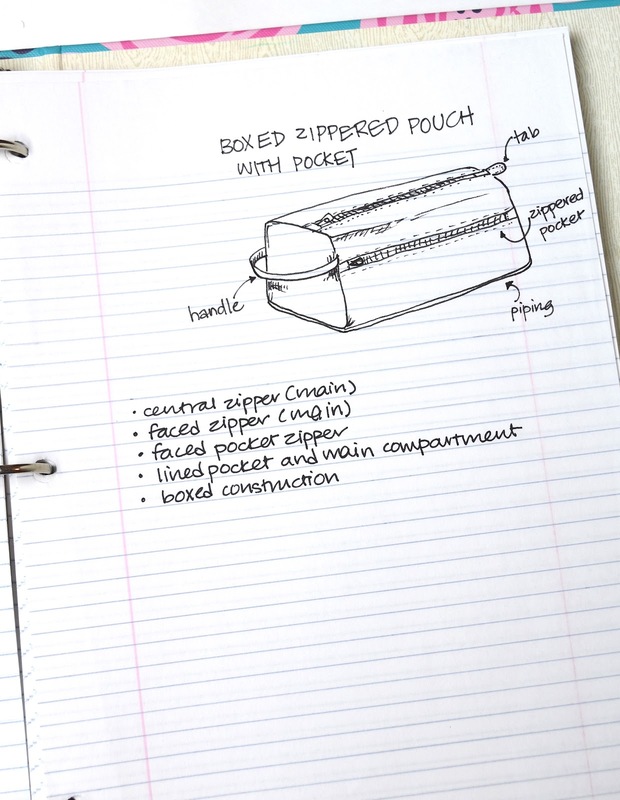 Or changing its shape by using circular or domed end-pieces instead of trapezoidal ones to make a duffel bag? Go forth and draft! I am really enjoying your tutorials! I took my machine to the doctor yesterday so I can sew along. Thanks for the great series! Thank you for sharing. One thought. 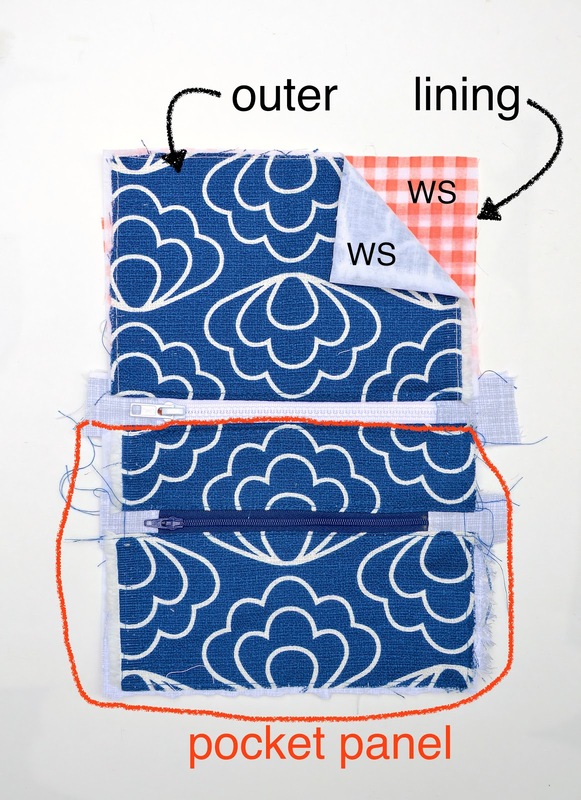 I know the focus here is zipper insertion rather than providing a pattern, but a couple of measurements added to the illustrations would really help those of us trying to work along side this tutorial. Wow, that side pocket instruction took me a couple of readings to get my head around. I had assumed the pocket lining was a top facing then you'd add another piece of fabric for the lining. I've done this before on bags I've made, so I just had to go through it until it finally made sense. I like this technique. 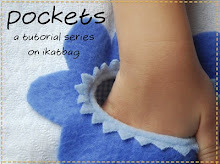 It keeps the zip firmly at the top of the pocket lining, and is a nice easy construction. 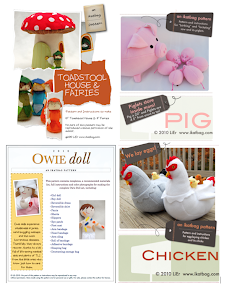 I agree with Sharyn, these are really well done and I understand they aren't patterns but a few measurements would really help if you wouldn't mind providing them. Thank you for all that you do! Yes, Helen, I do. Can't be done neatly otherwise. 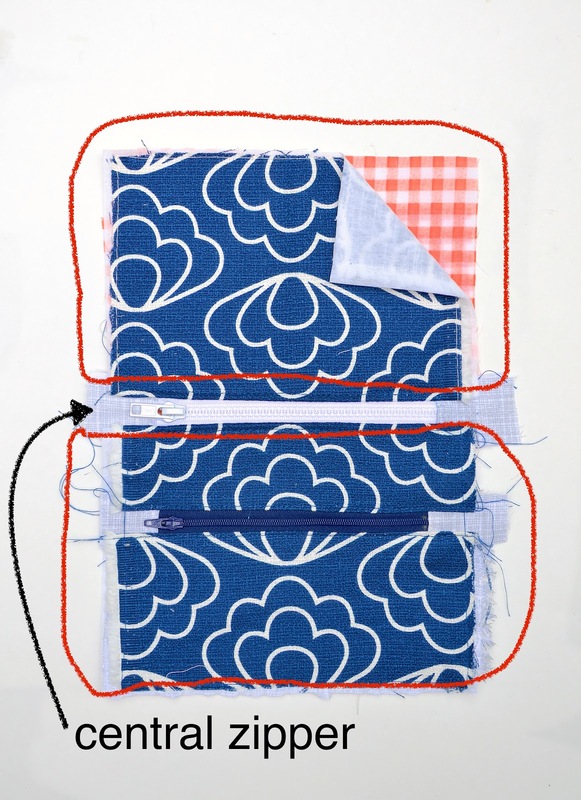 See this post for how to sew those corners: http://www.ikatbag.com/2012/02/hamper.html Hopefully it will help with the visualizing. Thanks for the link. Have experimented and indeed the corners look very neat! Thank you for your help. Will try this again and see if I can get the corners crisper..